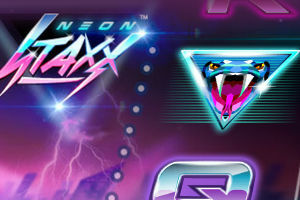 ………..The Neon Strax slot was released on the 25th June 2015 and offers a neon design in a similar style to the classic slot Twin Spin, whilst noticably sporting a fantastic 80s soundtrack, that you will never get tired of! The maximum win on a single spin within the main game is 1,000 Euros on Neon Strax and the maximum win from free spins is also 1,000 Euros and it is possible to win 40,000 Euros on a coinciding win. The minimum bet per spin is 0.2 Euros and the maximum is 100 Euros! Neon Staxx is a brand new 5-reel 4-row video slot with Free Spins, Scatter symbols, Wild substitutions and the ultimate SuperStaxx feature. 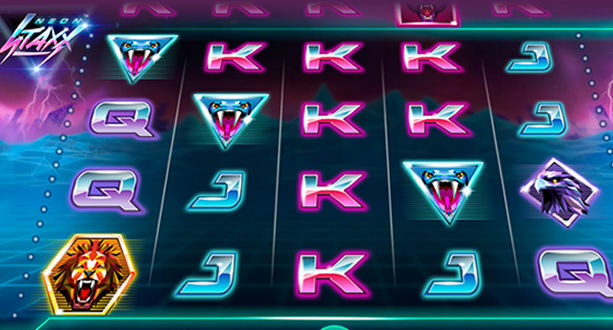 With the SuperStaxx feature, you have the chance to get massive stacks of symbols on the reels during each spin! Excitement galore! You can play the Neon Stax slot at any of the recommended sites below, all of which have this new game! 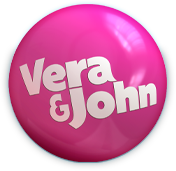 FREE SPIN OFFERS – Exclusive Neon Strax offer! *Promotion is available until 7th July 2015, 23:59 CET. Country Restrictions may apply.